Just like that, I quit my job as a theatre critic. And I couldn't be happier. I've reviewed theatre on and off for five years now. I was the theatre critic for the Colorado Springs Gazette from 2008 to 2010 and the Colorado Springs Independent from 2012 until now. It was a great learning experience, and I don't regret a moment of it. Thinking deeply about a play and then putting those thoughts into words is one of the best ways to improve your understanding of theatre as an art form. The free tickets were too not shabby either. But it just got too time-consuming. I'm a slow writer, and a 500-word review could take me 10 hours. With my playwriting career taking off, I just can't afford that time sink anymore. What's more, the pay is terrible. Ten cents a word isn't much to begin with, and it doesn't take a math whiz to realize that at the snail-like speed I write, I was making well under minimum wage. But the worst part was the havoc it wreaked on my relationships with theatre folk. Critics in New York can stay isolated from the artists they write about, but in a theatre community as small as Colorado Springs', it's impossible. You run into each other constantly: at plays, at parties, at fundraisers. Most of the actors and directors I wrote about were real professionals, maintaining a cordial front whenever we ran into each other. But I don't want to be cordial. I want to be an integral part of the theatre community, and I want to develop a close, creative relationship with the gifted artists who make their home here. I realize the vital role that theatre critics play. Despite the decline of the newspaper industry, people still rely on print reviews to help them decide what to see. And for a playwright, getting your play professionally reviewed is a requirement before you can even submit your play to many of the big publishing houses. But someone else is going to have to take that job. I'm just a playwright now. 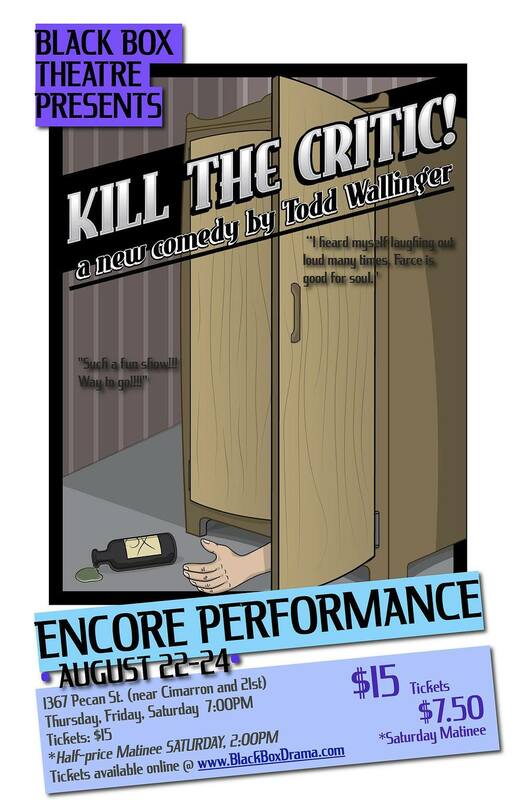 Good news for those of you in the Pikes Peak region who missed the world premiere of Kill the Critic! in June. The play will get an encore production next weekend--Thursday, August 22 through Saturday, August 24--for four performances only. All performances will be at Black Box Theatre, 1367 Pecan St., Colorado Springs. This production is directed by Nancy Holaday, as was the premiere, and features almost entirely the same cast. But if you did attend the premiere, there are some key differences that may make it worth seeing again. For one thing, the venue fixes a lot of the issues we had at the Tri-Lakes Center for the Arts. It's air-conditioned. Trains don't roar past every 15 minutes. The back row is much closer to the stage. And it's a true black box theatre, making the entire stage visible. This last one isn't always an important consideration, but it is for this play. In case you haven't figured it out yet, one of the characters is dead for most of the play, and when the stage is raised, as it was at Tri-Lakes, people sitting in the back of the house miss much of the all-important floor action (at one point, a cop inadvertantly uses the blanket-covered corpse as a footstool). And there's one other thing about this production. The actor who plays the hapless kidnapper was unable to make the last two performances so Nancy cast a new actor in the part. I liked the original lead. Although he struggled to learn his lines, and ended up ad libbing most of them, he delivered them with panache, giving the character a childike charm despite the self-centeredness that seems to define him. Responses from the audience were more w. Half of the people I talked to thought he was a brilliant comedian, but others thought he was painfully hammy. Early reports from rehearsal indicate that the new lead is much better, a natural comic who is also much more disciplined in his line readings. For complete info on the production, visit www.blackboxdrama.com. Labels: Black Box Theatre, Kill the Critic! 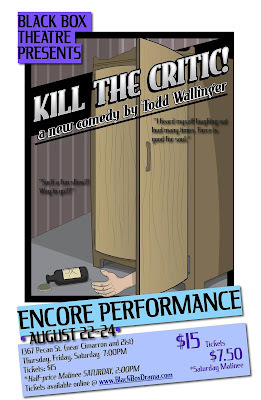 I just found out Kill the Critic! placed 2nd in the McLaren Memorial Comedy Playwriting Contest. This is on top of the 2nd place it took in the Robert J. Pickering Award for Playwriting Excellence. I won't lie. I was really hoping for a win as that would have almost guaranteed me another production and at least one published review--something I'm still seeking. But I'll happily accept 2nd place. The McLaren is one of the best known comedy playwriting contests in the country and the competition was tough.